I have read your book. “The Art of Chi Kung”, over 3 times now, and I’ve really enjoyed it. I look forward to reading “The Way of the Master”. Thanks for your kind words for “The Art of Chi Kung”. Many people have kindly commented that it is the best chi kung book they have read. It gives a comprehensive, yet in-depth picture of what chi kung is, as well as what practitioners in the pasts attained in practicing chi kung. Hopefully this book may prevent chi kung from degenerating into mere external forms. 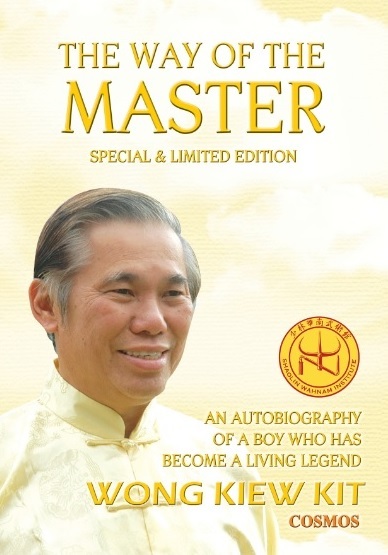 “The Way of the Master” is my autobiography, and has been kindly described by the editor as the real story of a small boy becoming a world legend. Interestingly, it is also the most entertaining book I like to read. Readers will not only have much reading pleasure, but also learn many useful lessons that can enrich their daily life. It a bit sad to see that some form of chi kung is lost, like your teacher Sifu Ho Fatt Nam could jump 10 feet from a standing position. I would love to practice that. Can you do that? My sifu did not jump 10 feet from the ground, but his sifu, i.e. my sigung did. I cannot do that, though I have other benefits of the Art of Lightness which my sifu taught me, like running up four storeys fast and without panting, and am flexible and agile at an age most people would consider old, i.e. 70, but I still regard as young. Although I can run up many storeys and long distances, I prefer to take an elevator or drive a car, or better still be driven by a careful driver. As I have often told my students, we should make use of modern facilities. It is worthwhile to know that chi kung methods were invented not for fun, but to meet expedient needs. Kungfu masters needed to learn the Art of Lightness to jump high as they were often ambushed by many opponents, and this skill enabled them to escape. I trained the Art of Lightness in my younger days. After many months of daily training I could jump up to about 5 feet. One morning I fell down and cut my thigh, which resulted in stopping my training. I discontinued my training not because of the cut, as I learned years ago that greatness lies not in never falling but in rising after every fall. I realized it was not a wise use of time, because now we have elevators and cars. Later my wife commented independently that she would love to see the Art of Lightness. Had I known this earlier, I would have continued my training just to make her smile. But this does not mean that my training was wasted. One I saved my niece, who was about five years old then, from possible serious injury. She was about to roll down a long flight of stairs. I rushed up to save her before she could roll two steps! What is the best form of mediation for calming the mind and raising consciousness? The best form of meditation for calming the mind and raising consciousness, or the best form of any art for any purpose depends on various factors, like the philosophy and methodology of the teachers as well as the developmental stage and needs of the students. For you if you have an opportunity to learn in our school, the best form of meditation is entering into a chi kung state of mind, which we do every time we practice. You may find it hard to believe, and many people may be angry at the statement, but it is true that in just a few seconds you will have a calmer mind and a higher level of consciousness than many others who have spend an hour sitting in a lotus position. I am crying as I write this. I myself suffer from Lyme Disease. My dad cannot keep track of his pills. He could not find his way through an airport. He has Parkinsons and dementia. He puts food all over the floor and cannot figure out how to put on his seatbelt. My dad cannot live without my mom. You dad is in a really bad shape. It is best that he goes to the Holistic Health Centre straightaway, without having to go for my regional course. It is ideal if you and your dad can have treatment at the Centre. You should be healed in three months, or perhaps two. But your dad may need six months. You can help him in the first month, but your help should be progressively less each day so that he could be on his own by the second month. This is definitely for his own good. He must learn how to be on his own, and he can do so everyday in one month. To be well means, for example, he has to eat his own food, not have someone eat his food for him, and do his own toilet, not have someone do it for him. He has first learn how to live, and then how to wholesomely enjoy living his life, all in six months. He can’t have someone feed him and pamper him for life, even if he has money to employ someone to do so. Your dad must give your mom a chance to live her life, but still loving to him and be his wife. It is very selfish of your dad to want your mom to be his slave, and it is also very bad for his own life. Your dad, your mom and you can have all these wonderful things, which are actually normal things, if you all really want them and work for them, not merely hope that they will happen. As my training progresses, my third eye continues to pulsate but less painfully so. I believe the vigorous circulation from Dragon Strength is helping. Prior to Penang, my focus was on the Small Universe and Cosmic Breathing. Small Universe will enhance whatever you do, and Dragon Strength will make it more powerful. The way you learned Small Universe and Dragon Strength was also in the right order. One would still have very good results if he learned Dragon Strength first, then Small Universe. But if he learned Small Universe first, then Dragon Strength, like what you did, the results will even be better. I’ve noticed that my general intuition as well as sensitivity to energy has grown exponentially over the years. For example, whenever I am visiting Buddhist or Hindu temples, I often now feel energy and force emanating from certain statues. Are these abilities related to the third eye? Your third eye is opening, or has opened. In practical terms it does not matter much whether you are at the opening stage or at the opened stage. Only those who intellectualize unnecessarily worry about such issues. As an analogy, it does not matter much whether your business if picking up or has picked out. What is important is that you are earning a lot of profit and your customers have gained a lot of benefit. The exponential increase of your general intuition and of sensitivity to energy is one of the many benefits that your third eye is opening or has opened. It is very important that you use this and other benefits for good and never for evil. We do good and avoid evil because we are righteousness. Even if one ignores righteousness and works only for self-interest disregarding the interest of other people, it is also for his own self-interest that he must do good. If he does evil, evilness will certainly return to him. The law of karma is certain. 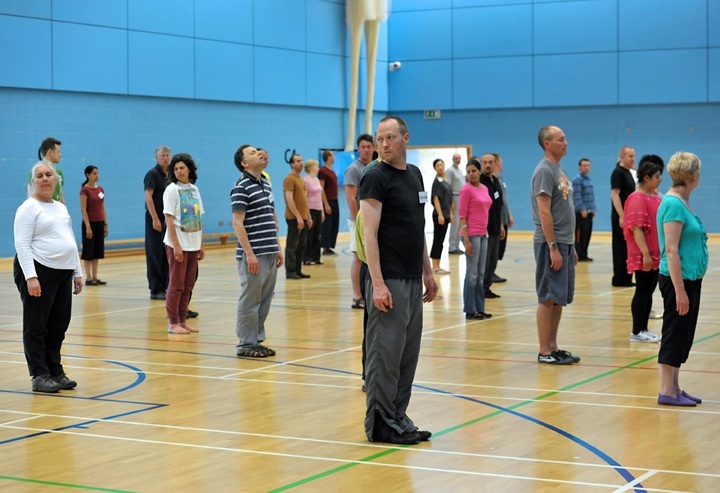 Dragon Strength learnt at the Dragon Strength course will enhance any art you practice! Is there a hidden link between our Dan Tian and our third eye? The more focused my energy is at the Dan Tian, the more my third eye seems to pulsate. Yes, there is a direct connection between the dan tian and the third eye, though I don’t know whether there is a direct link, like a meridian or some nerves in modern scientific terms, connecting them. The more powerful the dan tian is, the more effectively the third eye will function. In other words, if there is a lot of chi at the dan tian, the third eye will open and the person will be able to perceive things across space and time that is not normally possible in ordinary persons. On the other hand, if a person’s dan tian is weak, his third eye will be close. Not only he has no psychic abilities, his normal eyesight will also be poor. Finally, at what point will I know when my third eye is finally open and the pulsation stop? As suggested earlier, in practical terms it does not matter whether your third eye is opening or has already open. But for your curiosity, when pulsation has stopped for some time, and you are used to perceiving across space and time, your third eye has opened. But this is not absolute. Even when your third eye has open, pulsation may sometimes occurs, just as even when your business has established, it can still pick up. The most important issue is that, irrespective of whether it is your business or your third eye, you must always use the benefit for good and never for eveil. This entry was posted in autobiography, Chi Kung, Chi Kung Healing, chi kung state of mind, Grandmaster Wong Kiew Kit, holistic health cultivation center, internal force, Kung Fu, meditation, question-answer, Shaolin, Shaolin Wahnam, The Way of the Master and tagged Books, chi kung, chi kung state of mind, Grandmaster Wong Kiew Kit, healing, internal force, Kung Fu, lyme disease, meditation, overcoming illness, parkinson's disease, QUESTIONANSWERS, Shaolin, Shaolin Wahnam, Way of the Master on February 13, 2016 by Wei Joo Lee. As we move into 2016, it is worthwhile to look back over the years at what we in Shaolin Wahnam have discovered. Viewing these discoveries from a particular vantage point, some of our family members may not realise their great significance, but viewing the discoveries over many years, with reference to the general development of chi kung and kungfu, these discoveries are really remarkable, and may create history for posterity. One of the greatest of these discoveries is to enter into a chi kung state of mind, or to enter Zen in Shaolin Kungfu, or to enter Tao in Taijiquan. Shaolin Wahnam students today are very familiar with entering into a chi kung state of mind as we perform it every time we practice, but this concept, as we understand it, is actually new. I did not know about this chi kung state of mind in my students’ days, and most chi kung and kungfu practitioners today are unaware of it. The first time I read about the term, chi kung state of mind, was from the great chi kung master of China, Sifu Yen Xin. He mentioned that entering into a chi kung state of mind is crucial in chi kung training. He explained that it was a new term, probably coined by him himself, and in the past this mental state was known as “entering silence”. It dawned on me that in other cultures, the same mental state was described as attaining a heightened level of consciousness. I also recalled reading some chi kung literature that the mind, not energy, is the most important factor in chi kung, though it literally means “energy art”. The skill to enter into a chi kung state of mind was developed by me over many years. When I first taught chi kung to the public, I did not ask students to enter into a chi kung state of mind. But when I found the skill useful, I not only taught it, I transmitted it. One main reason why I could improve my teaching methodology tremendously, sometimes beyond recognition, is because I teach about a hundred classes a year, whereas most other teachers teach only a class or two. In other words, a typical chi kung teacher teaches his students a particular chi kung exercise one or twice a year, but I teach the same exercise a hundred times. This gives me a lot of opportunities to improve my teaching methods. Entering into a chi kung state of mind is fantastic. 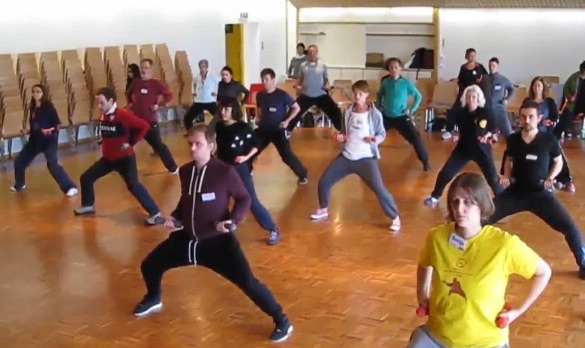 Now students at my Intensive Chi Kung Course can generate a chi flow within the first hour. My early students took about 4 to 5 months to generate a chi flow. Most other practitioners cannot generate a chi flow at will regardless of how long they may have practiced chi kung. Besides speeding up the attainment of our students, entering into a chi kung state of mind also enables them to accomplish unbelievable high-level results. In a regional course of Massaging Internal Organs of just 4 hours, even relative beginners can direct chi to their internal organs to massage them. In a regional course of Bone Marrow Cleansing, within 4 hours even relative beginners could direct chi to flow at different levels and derive various wonderful benefits. Others outside our school, even when they are sympathetic to us, may find it hard to believe. How do we know our students could direct chi to their internal organs or to whatever level they wish? In the respective courses, they reported form their own experience that they could do so. In principle, it is like asking someone sitting on a chair how he knows he is sitting on a chair. He knows from direct experience. Only those who have never directed chi to their internal organs or to whatever level they wish, would ask such a question. In kungfu training, two of the greatest discoveries, and which our students benefit immediately, are to develop internal force and to use kungfu for combat. These two attainments are actually the two pillars of kungfu training. In other words, all kungfu training, if it is done correctly and successfully, is geared towards developing force and combat efficiency. Again, as developing internal force and applying kungfu for combat are so common in our school that those who are not exposed to other kungfu schools may mistakenly think these kungfu accomplishments are the norms. Although we are not unique in having these abilities, they are certainly very rare. Most kungfu practitioners today, including some masters, do not have internal force, and do not know how to use kungfu for combat. 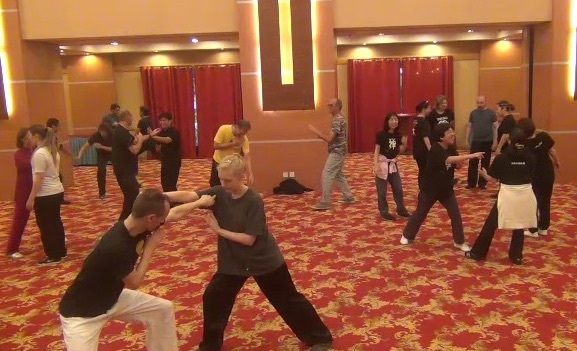 One of the crucial factor that enables me to discover methods that enable our students to develop internal force and to apply kungfu for combat was differentiating between skills and techniques. This itself was a remarkable discovery. In my students’ days, I did not know the difference between skills and techniques, Most kungfu practitioners today, including masters, do not differentiate between skills and techniques. 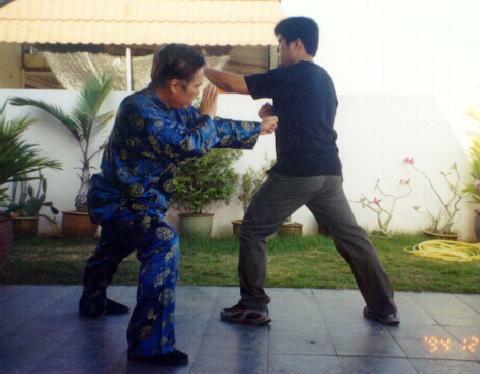 The techniques used by all kungfu practitioners to develop internal force and to apply kungfu for combat are genuine. But most practitioners (outside our school) do not have the necessary skills, and they are unaware of it. Those who persist in the techniques for many years and eventually succeed, become masters, and they form a very small proportion of the starting population. The others fail, or give up half-way. From our perspective, the most important discovery is to transfer our chi kung and kungfu training to enrich our daily life. We do so purposefully and systematically, and I am very happy that we have been very successful. Previously I thought that the biggest group of people who wrote to thank me would be those whom I helped to cure from so-called incurable diseases. But this was not so. The biggest group of people, by a very big margin, who wrote to thank me were initially healthy. They thanked me for sharing our arts that enabled them to enrich their lives as well as the lives of other people. Like other discoveries, this discovery was, and is, not common in kungfu circles. Many past masters, despite their high chi kung or kungfu attainment, did not lead happy lives. Some of them, due to their training, were more efficient in their work than had they not trained chi kung or kungfu, but unlike us they did not consciously apply their chi kung or kungfu training to enrich their lives. Today’s situation is worse. Many chi kung and kungfu masters are sick, physically or emotionally, and some have to take medication on a routine basis. A world known surgeon told me some shocking news — more than 75% of his patients were top martial artists, and their most frequent treatment was hip replacement. These top martial artists practiced their arts as hobbies, which ware meant to give them pleasure! We in Shaolin Wahnam are indeed very lucky. We have good health, vitality and longevity — though some of you may have to wait 30 years to confirm this benefit. We have mental freshness and mental clarity as well as spiritual joys, irrespective of religion, like being peaceful and happy. 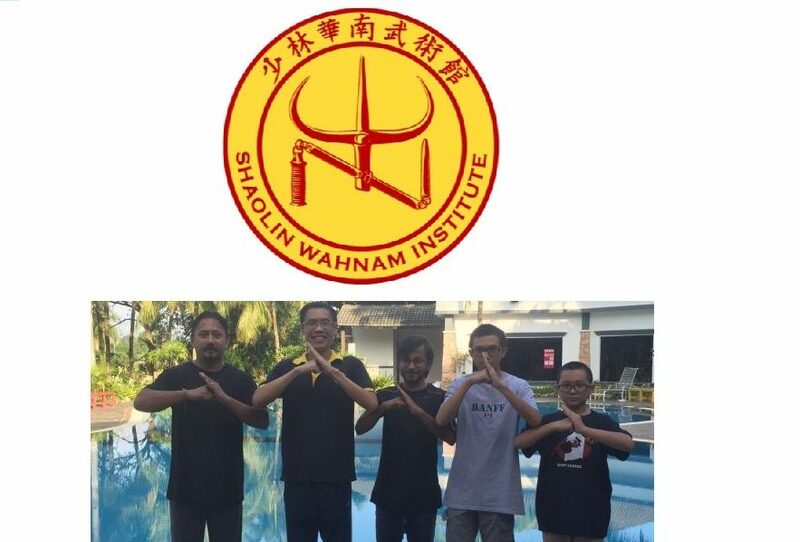 I wish all our Shaolin Wahnam family members and all our guests good health and happiness. This entry was posted in announcement, Chi Kung, Chi Kung Healing, chi kung state of mind, Grandmaster Wong Kiew Kit, internal force, Kung Fu, mental clarity, Shaolin, Shaolin Wahnam, tai chi chuan, taijiquan and tagged chi kung, chi kung state of mind, Grandmaster Wong Kiew Kit, gratitude, healing, internal force, Kung Fu, kung fu culture, mental clarity, Shaolin, Shaolin Wahnam, taijiquan on February 9, 2016 by Wei Joo Lee. Ana Burgui has been on a wheel-chair for more than ten years. She took a special 3-day healing session with Grandmaster Wong from 9th to 11th September 2015 in Alicate, Spain. On the first day, Ana could hardly stand on her own for a second. Grandmaster Wong explained that according to physics, our feet were too small to support our body weight, but we could stand because of chi flow. He generated a chi flow in Ana. The video below shows the healing sessions on the second and the third days. Unfortunately, no video was recorded on the first day. As the end of the video shows, from sitting in a wheel-chair on the first day Ana could walk a few steps on the third day on her journey to be able to walk again. 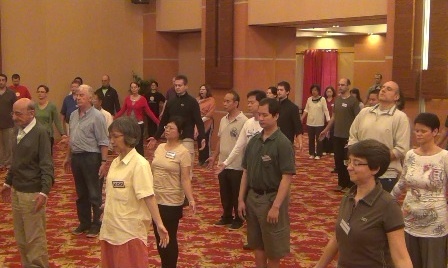 Healing Ana to Walk Again — Part 1 Alicante 2015 from Wong Kiew Kit on Vimeo. Healing Ana to Walk Again — Part 2 Alicante 11th Sept 2015 from Wong Kiew Kit on Vimeo. This entry was posted in Chi Kung, Chi Kung Healing, Grandmaster Wong Kiew Kit, Healing, incurable, motor neuron diseases, overcoming illness, Shaolin Wahnam and tagged chi kung, chi kung healing, Grandmaster Wong Kiew Kit, healing, incurable, motor neuron diseases, overcoming illness, Shaolin Wahnam, walking again on December 1, 2015 by Wei Joo Lee. Sifu I am still unclear about the harm that could be brought by over training or the training is too powerful. Your question, or comment, is illuminating, and I would like to give a more detailed answer. Over-training is a unique problem in our school. By “unique” I don’t mean that no one in the past over-trained. What I mean is that no school as a whole in the past and at present over-train at a scale and depth as we do. Our over-training is closely related to our unbelievable cost-effectiveness. Our student can attain in one month what most other students would attain in one year — if they are lucky enough to practice genuine chi kung or genuine kungfu. Most people, understandably, may consider us boastful over this statement, and some may become angry. They may concede that our school is twice better than most schools, or may be even three times better, which is a lot. But most people would not believe that we are more than 10 times more cost-effective than others, just as most teachers would not believe that a teacher could earn more than $20,000 a month. Yet our typical student is more than 10 times more cost-effective than most other students, just as some rare teachers, not necessarily teaching in public schools, earn more than $20,000, though this is a small sum for some high-income earners like doctors and businessmen. My conclusion that our typical students gain more than 10 times the benefits gained by other students is not made out of imagination, but based on facts. Our typical students have internal force after practicing for three months. How many other kungfu practitioners have internal force after practicing for three years? Our typical students can use our kungfu for combat after practicing for six months. 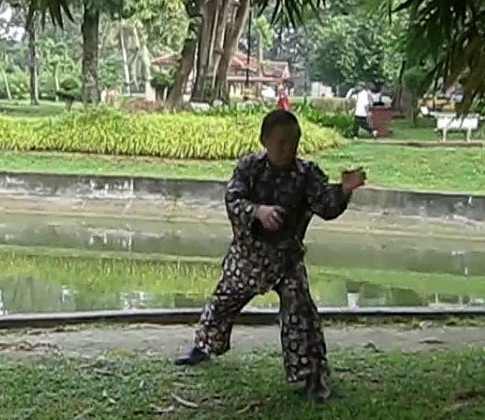 How many other kungfu practitioners can use their kungfu for combat after practicing for six years. Your Holistic Health Cultivation Centre has helped many people suffering from so-called incurable diseases, including cancer, to recover after undergoing healing sessions for a few months. How many patients of so-called incurable diseases overcome their illness after treatment elsewhere after many years? These examples are facts, not opinions. Anyone can find out whether the statements are true. Hence, when our typical student gets 10 times the result of what other students get in other school, our students are over-training. Over-training means the benefits one receives from his training is too much or too fast for his body to adjust to, resulting in unpleasantness, tiredness, pain or other adverse effects. These adverse effects are a sigh to tell the practitioner to slow down his training so as to allow the body more time for adjustment. There are two main ways to slow down one’s training — by reducing the time of training or reducing the intensity of training. When one trains an hour a day, he can reduce the training by training for 15 minutes. But if he trains for only 15 minutes a day, like what our students do, there is not much time for him to reduce, though now, because of our increased efficiency, I advise our students to train for only 10 minutes. We can also reduce the time of training by reducing its regularity. If a student trains for 10 minutes a day everyday, and still finds himself over-training, he can train once in two days, or once in three days. If he is advanced and powerful and still finds himself over-training, he can train just once a week. But most of our students enjoy their training. They may not be happy training just once a week. An excellent approach to prevent over-training is to reduce its intensity. This is very effective for our instructors and advanced students who over-train. An excellent way to reduce the intensity is not to go too deeply into a chi kung state of mind. In fact it is precisely because we enter into a deep chi kung state of mind that we have excellent result. In theory it is simple, but in practice it may be difficult, even for our students. Here are some suggestions. Don’t take too long, like a minute, to be relaxed and clear the mind of all thoughts, and remain in this heightened level of consciousness. Take just a second or two. Relaxed, clear your mind and perform your exercise. You can also focus on your form. If you are a beginner, get the outward form correct as best as you can. If you are advanced, aim for picture=perfect form. When you focus on your outward form, you perform the chi kung exercise more on the physical level and less on the mind level. Your result will be less, but it is still a lot compared to what other practitioners get, and minimize the possibility of you over-training. You may notice that when students begin to learn form me, I ask them to not worry about their form. This is to get them onto the mind level and generate a chi flow. As they become more advanced, they pay more attention to their form. Another suggestion which is negative but can prevent over-training is to purposely intellectualize and purposely tense your muscles once awhile. Tensing your muscles is not advisable, unless for specific reasons, but thinking of good thoughts while practicing is permissible. The intellectualizing will get you out of or to a shallower level of a chi kung state of mind, thus producing less result and preventing onver-training. Purposely tensing our muscles can be useful in specific situations. When I sparred with somebody and accidentally hit him, and I sensed that my internal force was going into him, I purposely tense my muscle to prevent the flow of internal force hurting him. When you have over-trained but for some reason you still want to train, you can tense your muscles to prevent a lot of force developing. It can be uncomfortable. You have to do a gentle chi flow to clear the blockage. Performing physical activities like practicing kungfu sets at a physical level, sparring with classmates, or going out with your family or friends, is a good way to expend energy, thus reducing over-cleansing due to over-training. Remember that practicing chi kung is to enrich our life and the lives of others, and not to enslave ourselves to it. If you can get benefits in 10 minutes, you don’t have to practice for an hour. Use the time to enjoy other wholesome activities. Over-training is very important in healing, i.e. teaching patients at a level much higher than they can absorb, or enabling them to recover faster then they can cope with. I shall deal with this topic in the next question you ask. A healer told me that too powerful chi kung would not harm a patient. I told him that it would be harmful. The healer said that he was already an expert in chi kung healing. What is your comment, Sifu? You are right and the healer wrong. Too powerful chi kung is not only harmful to sick people, it is also harmful to healthy persons. It is like asking someone to run a marathon or lift heavy weights. Even when he is healthy, if he is untrained, running a marathon or lifting weights will be harmful to him. If he is sick, it will aggravate his illness or may even kill him. It is like taking medication. If a doctor asks a patient to take two pills, the patient must take two pills. If he takes 10 pills, he may be killed. As you know very well, chi kung for healing is the lowest level of chi kung. The other levels in ascending order are chi kung fro health, chi kung for scholars, chi kung for warriors, and chi kung for spiritual cultivation. Although it is at the lowest level, chi kung for healing is the most useful today. This is because many people today, unlike in the past, practice chi kung to overcome their pain and illness. If a healer teaches chi kung for warriors to sick people , he may kill them. It is like putting an engine of an aeroplane in a small car. That healer may be an expert if he knows a lot about chi kung healing, but he may not be a master healer. A master healer is determined not by how much he knows but how well he helps patients overcome their illness. Someone told me that as long as a person spent one hundred thousand hours on an art, he became a genius. I don’t agree because there are many other factors involved for one to become a genius or a real expert. What is your opinion, Sifu? I agree with you, and disagree with the person who said that if one practiced an art one hundred thousand hours he would become a genius. If his practice is wrong, he becomes a big fool. Not only he has waste his time and effort, he has harmed himself, often seriously and unnecessarily. This is the case with many martial artists today. They practice a martial art so as to become healthy and be able to defend themselves. But the more they practice the more unhealthy they become, and they cannot defend themselves. They merely exchange blows and kicks with their sparring partners in free sparring, and their injuries are usually unattended to. Here is a list of factors a student may work on to get the best benefits from the practice of any art. Have a sound philosophical understanding of the art. Define his aims and objectives in pursuing the art. Find the best available teacher according to his (the student’s) resources. Practice the art according to the way the teacher teaches, and not according to the way the student thinks the art should be practiced. Periodically access his result according to his set aims and objectives. The same guidelines can also be applied to a patient seeking to overcome his illness and attain good health, vitality and longevity. Have a philosophical understanding of his illness and healing. Set aims and objectives, like overcoming his illness, and attaining good health, vitality and longevity. Seek the best healer according to his resources. Practice the healing procedure according to what the healer prescribes and not according to what the patient thinks to be done. I’ve been reviewing some videos to further increase my knowledge of what the world thinks about Baguazhang and recently saw a few Baguazhang weapons videos. What you are doing will contribute much to your understanding and attainment in Baguazhang. But it is important to know that what the world thinks of Baguazhang and what videos show on Baguazhang weapons may not be what Baguazzhang and Baguazhang weapons really are. This awareness is even more important in many other styles of kungfu, chi kung and spiritual cultivation. Indeed, it is shocking how much kungfu, chi kung and spiritual cultivation have deviated from their original purposes and practice as shown in what the world thinks of these arts, and in what videos, even by well known world masters, show these arts to be. What the world thinks of kungfu is often represented by Bruce Lee, despite the fact that Bruce Lee rejected both kungfu philosophy and methodology. For example, Bruce Lee thought that stance training, which forms the foundation of all kungfu, was ineffective, and his training methods were precisely what traditional kingfu masters warned against. If you examine videos showing free sparring amongst kungfu practitioners, with the exception of those from Shaolin Wahnam, virtually all of them use boxing and kick-boxing, with hardly any kungfu techniques. If you watch videos on kungfu weapons, again with the exception of those from Shaolin Wahnam, there are hardly any on using kungfu weapons in combat, which is precisely the reason why the weapons are for. If you watch videos on the demonstration of a Guandao, or the Knife of Guan, which is a long, heavy weapon, you will see that the controlling hand of most demonstrators holds the weapon just below its blade, and that the blade of the weapon is flimsy, which negate its advantage of being a long weapon, and a heavy weapon. Holding the weapon just below its blade would not enable its practitioner to use it on horseback or to cut it through the armour of an opponent, which were precisely what a Guandao was for. One of the weapons that many people mention when discussing Baguazhang is the Deer Horn Knife (I’ve also heard them called the Meridian Knives and the Mandarin Duck Knives). I have to admit, the weapons look rather spectacular, having many cutting edges and sharp points. I was wondering what are the special characteristics of the Deer Horn Knives? 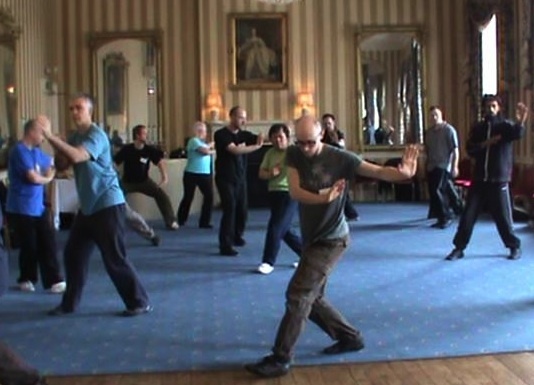 How do they enhance Baguazhang practice? Are certain weapons more conducive to enhancing or bringing out the best of Baguazhang, such as the straight sword, the single knife, or the huge “Bagua dadao”? The Dear Horn Knives are so named because diagrammatically they resemble the antlers of a stag. They are also called Meridian Knives and Mandarin Duck Knives because they are always used in pair. Indeed, they look spectacular. The weapons are just sharp edges and points. The special characteristics of the Dear Horn Knives are its sharp blades and points, which make them highly destructive. It is almost impossible for an opponent to dislodge the weapons from the exponent. The horns of the weapons can be used to lock or capture an opponent’s weapon. Any hit of the weapons will cause bloodshed. The main techniques are cutting, slicing and piercing. Interestingly, while the Deer Horn Knives are closely associated with Baguazhang, their training does not enhance Baguazhang practice. Circulating the hands round the body is a special feature of Baguazhang, but the sharp blades and points of the Deer Horn Knives do not facilitate this feature. But the agility of Baguazhmg contributes to an effective application of these weapons, so long as the exponent does not circulate the weapons round his body and cut himself. The straight sword is the most conducive in bringing out the best in Baguazhang, and vice versa. 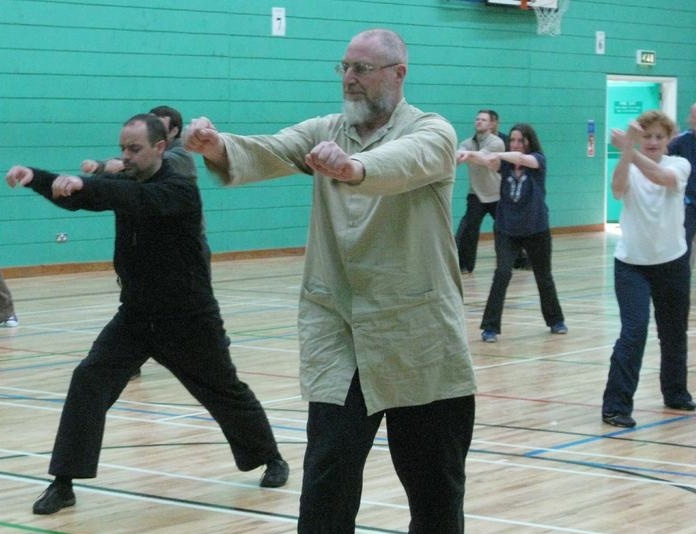 In both the sword and Baguazhang, agility and flowing movement are of utmost importance. The swordsman, however, must not use his sword to circulate round his body like what a Baguazhang exponent does with his hands. The Single Knife, or sabre, is also conducive in bringing out the qualities in Baguazhang, and vice versa. Circulating the sabre or the arms round the body is a frequently used skill in sabre and Baguazhang performance and application. About a week or two ago, I felt the “false breakthrough” of the Small Universe during Baguazhang Circle Walking. It was the first time that I’ve clearly felt energy flowing through meridians (normally, my energy feels more diffuse or like waves passing across my body). I was walking the circle and my posture aligned in such a way that I began clearly feeling pockets of energy flowing along the Small Universe circuit. I was wondering if Baguazhang, or any other particular martial arts, particularly well known for achieving the Small Universe and Big Universe? Congratulations for your break-through of the Small Universe, even though it is “false” or apparent, and not “real” or permanent. A “false break-through” does not mean it is only an illusion and that there is really no break-through. The term “false” is used relative to “real”. A “false break-through” does not mean there is no break-through. It occurs when a bubble of energy goes round the Ren and Du Meridians, and the defilements that block the meridians are being pushed through by the bubble of energy, but they may resume their blockage after the bubble has gone through. A “real break-through” occurs when the Du and Ren Meridians are fully filled with energy flowing continuously and harmoniously round the meridians. A real break-through of the Small Universe enables practitioners to live beyond a hundred years. 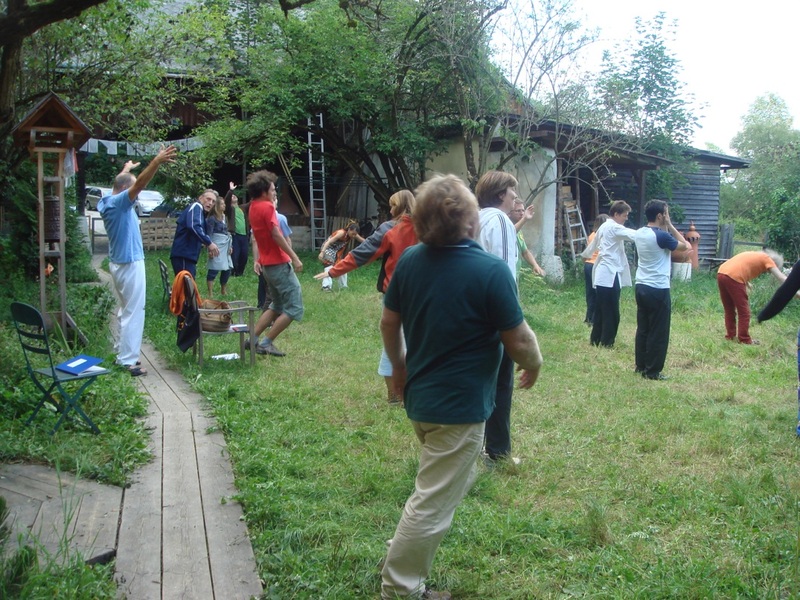 Baguazhang being an internal art is more suitable than many other kungfu styles for attaining a Small Universe. But only Baguashang masters who have practiced for many years may have this attainment. It will be faster if they learn the art of Small Universe separately. But Baguashang practitioners who practice only the external aspects of Baguazhang will never attain the Small Universe. If all other things were equal, Wudang Taijiquan and Dragon Strength would be more effective than Baguazhang to attain the Small Universe. This is because the internal force in these two arts is more flowing than that in Baguazhang. Your attaining a break-through of the Small Universe, even a “false” one, is remarkable. Congratulations. Such an attainment is not likely to happen in most other schools. Also, I remember hearing from my Sifu that Reverse Breathing is an important part of Small Universe training. I do know that at some point I would like to open the Small Universe, thanks to you, Sigung, and my Sifu’s writing about its amazing benefits. I learnt Reverse Breathing at Goat Stance from my old Taijiquan sifu, and I had some good benefits like beginning to build and store energy at my dan tian, but I haven’t practiced it in a long time (mostly because shortly thereafter, I learnt from you and my Sifu in Florida). Would it be worthwhile for me to begin practicing Reverse Breathing at Goat Stance if I wanted to further pursue the Small Universe, or should I wait until I’m able to spend a fair amount of time with you or my Sifu (for example, at a Small Universe course) to learn how to attain the Small Universe? Reverse Breathing is an advanced art. It should be learnt from a competent teacher as wrong practice can cause serious problems. When I was learning the Small Universe from my sifu, Sifu Ho Fatt Nam, I made a mistake unknowingly while practicing Reverse Breathing. My chi accumulated about an inch on one side of my dan tian (I can’t remember now whether it was on the left side or the right side). It took me about three months of remedial exercise to correct it. Many people mistake Reverse Breathing as Chest Breathing. They are different, though they look alike. In both cases, a practitioner’s chest rises as he breaths in. It rises more in Chest Breathing than in Reverse Breathing. But in Chest Breathing it is air that goes into the chest. In Reverse Breathing it is energy, not air, that goes into the dan tian, or flows in a small universal circuit. You should not attempt Reverse Breathing on your own. You can learn it from your sifu if you spend a fair amount of time with him, or learn it from me at a Small Universe course. I was talking with Sifu recently and he told me that at my level I really needed to begin practicing regularly with other people to further refine my sparring and fighting skills. Funnily enough, shortly after the Legacy of Wong Fei Hoong Summer Camp (which I was unfortunately unable to attend), I was lucky enough to find a good school of Hoong Ka Kung Fu. One of the things I liked immediately was the fact that the school does a lot of Asking Bridge in preparation for free sparring. Even though I haven’t had more than a handful of opportunities to train with and spar with people in the past two years, my stances, footwork, and internal force served me very well; I was routinely driving back and out-flanking people who had been in this school for about four or five years. The sifu complimented me on my solid stances and how my footwork always seemed to cut off my partner’s avenues of escape. I wanted to thank you again for teaching me those skills in Baguazhang, they are coming in handy a lot here! This is no surprise because we pay a lot of attention on stances and footwork, but many other schools don’t. And Baguazhang is well known for footwork. I did have a question about Asking Bridge and “bridging” in general. I noticed that this school and many others (which I’ve seen mostly in documentaries and on YouTube) use the One Finger Zen hand-form (which they call “Bridge Hand”) and their forearms for initially contacting with an opponent’s arms, especially during or immediately after defending against a strike. What is it about this hand-form that makes it so popular in Hoong Ka schools compared to, say, the thread hand, Tiger Claws, or open palms? I personally feel more comfortable and sensitive with the thread-hand and open palms, but that may just be my Baguazhang background. “Bridge Hand” or “kiew sau” in Chinese (Cantonese) refers to the forearm, not the One-Finger Zen hand form. The forearm is called a “bridge” because it is the part that is usually in contact with an opponent. The term “Bridge Hand” is usually used in Hoong Ka Kungfu, and other styles derived from Southern Shaolin. 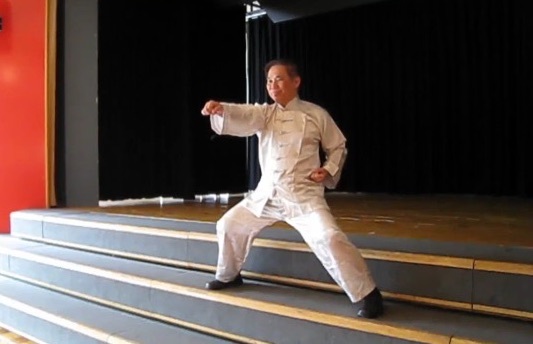 It is seldom used in internal arts like Taijiquan, Baguazhang and Xingyiquan, or styles derived from Northern Shaolin like Praying Mantis, Tantui and Wuzuquan. Besides in our school, the One-Finger Zen hand form, which is different from “Bridge Hand”, is now found mainly in Hoong Ka Kungfu, and rarely in other kungfu styles. It is mainly used to develop internal force, and at advanced levels for dim mark, i.e. dotting energy points. However, I suspect that most students today just perform the external form of One-Finger Zen hand form without knowing its inner significance. In Hoong Ka Kungfu the One-Finger Zen hand form is used to develop internal force, though many Hoong Ka practitioners may not know how to do so, or may not even realize it. They perform the hand form because it is found in their sets, just as most kungfu practitioners of any style today perform their patterns because the patterns are found in their style, but they do not know the significance of these patterns. In combat or even in solo performance, the thread hand using the dragon hand form, the tiger claw and the open palm are equally popular. In fact, when deflecting an opponent’s attack, like a thrust punch, Hoong Ka practitioners seldom use the One-Finger Zen hand form; they use the thread hand, the tiger claw or the open palm. As an analogy, the Horse-Riding Stance is usually employed when developing internal force. But in combat it is seldom used. Why is the One-Finger Zen hand form found in Hoong Ka and not in other styles. This was probably because the One-Finger Zen hand form was widely used in developing internal force in Southern Shaolin, and Hoong Ka Kungfu was the moist typical of Southern Shaolin. In fact, Hoong Ka patriarchs like Wong Fei Hoong and Lam Sai Weng called their kungfu Shaolin, and not Hoong Ka. Then why is the One-Finger Zen hand form not found in other Southern Shaolin styles like Wing Choon and Choy-Li-Fatt. This was probably because the first patriarchs of these styles used other methods of force training. 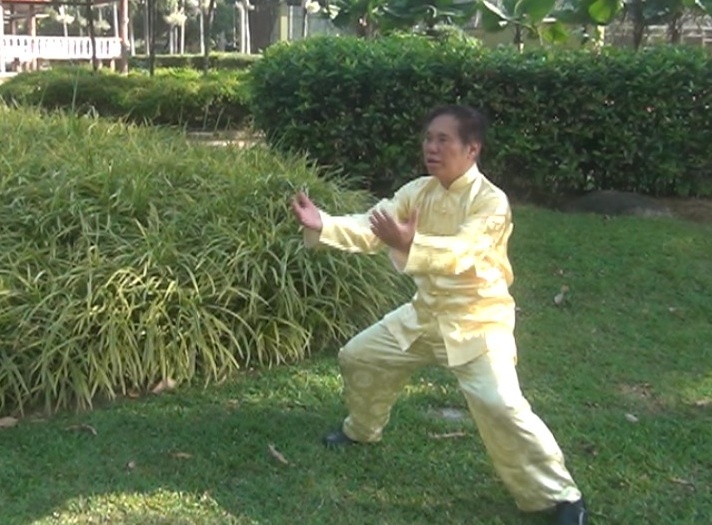 Yim Wing Choon, for example, used Siu Lin Tou which did not have the One-Finger Zen hand form. 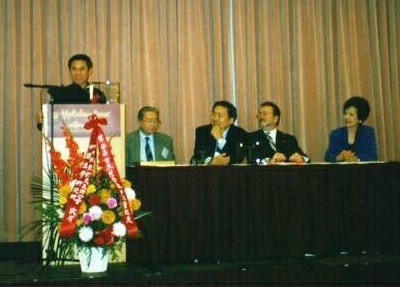 Chan Harng, the founder of Choy-Li-Fatt used a wooden man. Editorial Note: Fredericks other questions will be continued at June 2015 Part 3 issue of the Question-Answer Series. This entry was posted in baguazhang, Chi Kung, Chi Kung Healing, Grandmaster Wong Kiew Kit, Kung Fu, Kung Fu Weapons, question-answer, Shaolin, Shaolin Wahnam and tagged baguazhang, chi kung, chi kung healer, Grandmaster Wong Kiew Kit, healing, Kung Fu, kung fu weapons, Qigong, QUESTIONANSWERS, Shaolin, Shaolin Wahnam on June 9, 2015 by Wei Joo Lee. I am a teacher at a senor citizens’ home. After reading your book, “The Art of Chi Kung”, I decided to try it myself. I tried both the Moon and one of the other momvements to induce chi. I found nothing happening. The only thing that happened was that I started to fall forward as if I was loosing my balance. After two or three times like this I finally started to sway. I am not sure if I consciously started to sway or it was from the movement. It is difficult to tell from an e-mail description whether your reaction was due to induced chi flow, or due to your loss of balance, or due to your conscious attempt to sway. But even if your sway was due to chi flow, it did not necessarily mean you were practising chi kung. Chi kung is not merely swaying. I decided to try it in my class of 8. I had the class close their eyes and I said to them if they started to sway they were to go with it. (in accordance with the instructions in your book). Out of the 8 only one started to sway. Is this sway something that is consciously brought on, or is it just supposed to happen? Yours is a typical example of how little knowledge and respect many Westerners have of chi kung. Many Westerners (and modern Easterners) think that they can just read from a book, try some exercises on their own, and then start teaching others. Especially if they are unemployed, they may continue teaching so-caled chi kung for a living, and after a few years they may call themselves, or others may call them, masters. You have done yourself, your students and the art a great dis-service. 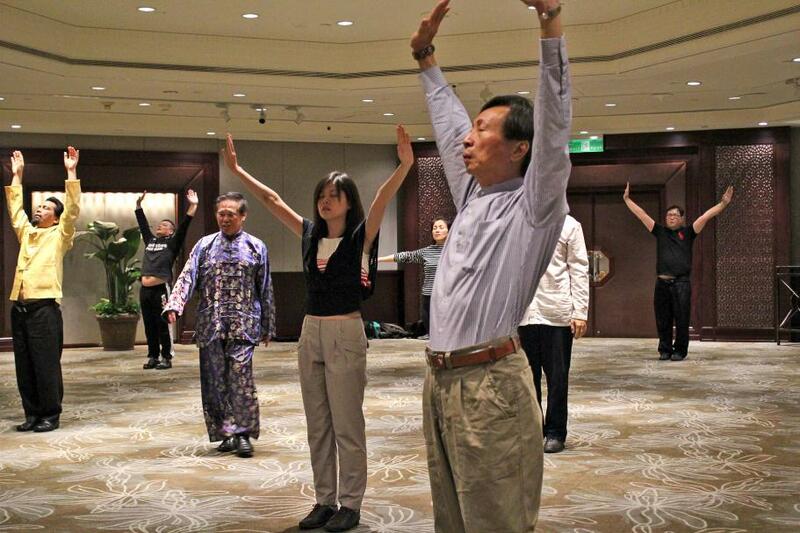 You have not learnt or practised chi kung properly, yet you have started to teach others. This is unprofessional. You do not understand the effect chi flow has on your students, and despite my warning in my books that incorrect practice may lead to serious harmful effects, you have decided to try it on others. This is unehical. Also, I am very interested in your intensive courses on healing incurable diseases. However, financially it is impossible for me to travel to Malaysia. Are you planning by any chance to bring your classes to the United States, or can someone learn what you teach through a video? And do you have such videos available? Merely being interested is far from sufficient. Before you think of becoming a healer or a teacher, be a student first. The large number of people, especially in the West, who imagine that they can become healers or masters, without having to make the minimum effort to learn and practise the art first, really amazes me. I sometimes teach in the United States. I also had a lady whose heart started to beat fast after the exercises in your book. Does this have any significance, as she was starting to get a little nervous? Luckily she did not collapse. Your unprofessional teaching could have killed her. The heart starting to beat fast during a chi kung exercise may or may not be good. It depends on various factors. In my teachng, many students with serious heart problems had their heart beating very fast during their practice under my supervision. I had to be extremely careful, and observe them and their reactions closely. On one occasion I was about to ask a student to slow down and stop when she exclaimed how wonderful she felt. She as well as the other students soon recovered from their illness. But a less experienced instructor might have killed them in similar situatons. Teaching chi kung to those with heart problems must be done by a master. Even trained instructors may not be competent enough to handle students with serious heart problems. In such cases, it is best for the instructors not to teach these students. The question and answer are reproduced from Questions 11 to 14 of the January 2000 Part 1 issue of the Question-Answer Series. This entry was posted in Chi Kung, Chi Kung Healing, Grandmaster Wong Kiew Kit, Kung Fu, Kung Fu Weapons, question-answer, Shaolin Wahnam Insight and tagged chi kung, chi kung healer, Grandmaster Wong Kiew Kit, healing, Kung Fu, QUESTIONANSWERS, Shaolin Wahnam on May 16, 2015 by Wei Joo Lee.